What are these white spots on your nails? Remember looking down at your nails and seeing white spots on them? Most of us would have seen them there before. But what do white spots on our nails mean? There are many sayings for the reason of white spots appearing on our nails. If you recall back to your schooling days, having a white spot on your nails can mean that someone is crushing on you which can make us all a little excited as those are one of the exciting moments in our schooling days. Can you imagine looking down at your nails one day and you see about 10 white spots on your nails? There are also other folklores about white spots on your nails. Here is the list that we have found. If you see a white spot on your nail, it means that you may be getting a present once the white spot grew until the end of your nails. If you see white spots on your hands, it means you have eaten too much mayonnaise. The number of white spots on your nails tells the number of people that are having a crush on you. White spots on nails mean that you have a calcium deficiency and that you must drink more milk. Are these actually true? Nope. 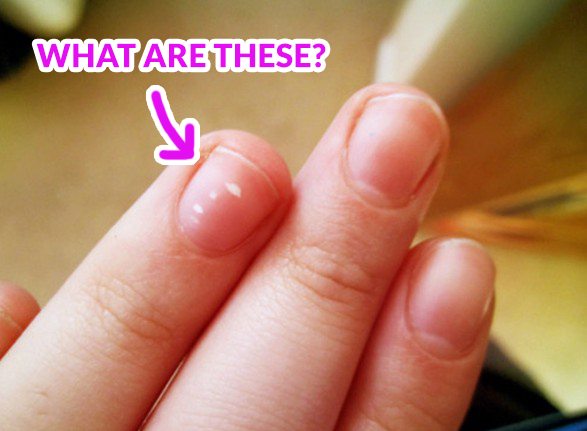 So what is the real reason behind these white spots on your nails? These white spots on your nails are actually known as Leukonychia are actually caused by damage to the base of the nail, an area known as the matrix. The reason you see these white spot on your nails is probably due to an injury to the base of your nails. These white spots only show up about a month later which you would already forget about any injury or bang done to your nails. It could be caused by manicures that placed an excessive pressure on the base of the nail. It could also be a sign of an allergic reaction to the nail polish or nail hardeners. However, do not worry. These are very common and will grow out as your nails grow. Though it can take up to 8 months which means the spots will be stuck with you for a while.